Place dried cherries in a bowl or tall glass. Pour stout over cherries until fully submerged. Allow to sit at room temperature for 1 to 2 hours. Drain, reserving 1/4 cup of the soaking liquid. In a food processor, add the pretzels and brown sugar, process until only crumbs remain, about 3 to 5 minutes. Slowly add the melted butter while the processor is running. Pour into the bottom of a 9 X 13 inch baking pan. Use the flat bottom of a heavy glass measuring cup or mug to press the crust really well into a flat even layer. In the bowl of a stand mixer, add the cream cheese, beat on high until creamy, about 3 minutes. Add the sour cream and beat until well combined. Add the salt, flour and sugar, mix until well incorporated. Add the eggs and vanilla, one at a time, mixing well between additions. Add 1/4 of the stout used to soak the cherries, mixing until just incorporated. Place in the oven and reduce oven temp to 350. Bake at 350 for 28-32 minutes or until the cheesecake has puffed slightly and center no longer jiggles when you shake the rack it sits on. 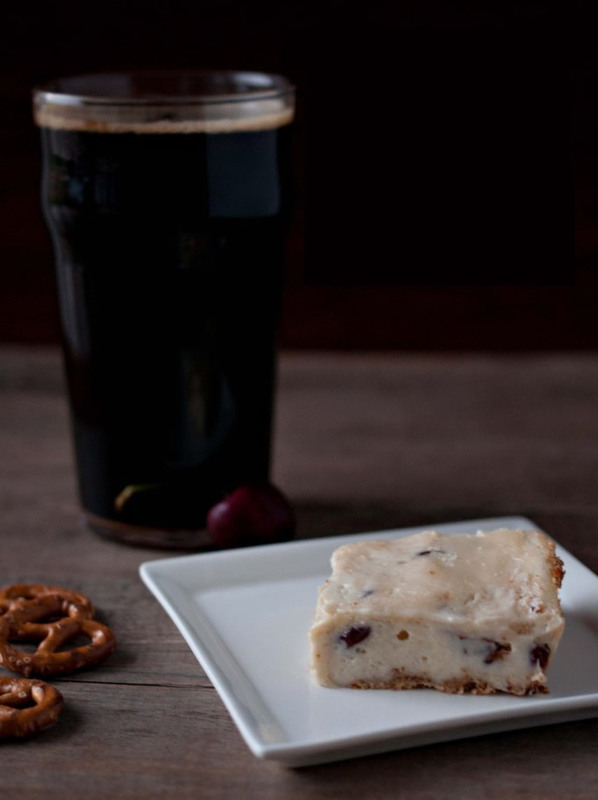 Don’t over bake cherry Stout Cheesecake; it will firm up once it chills. Remove from oven (allow to stand at room temp until slightly cooled). Refrigerate until chilled and set, at least 4 hours and up to 24. Cut into squares for serving. 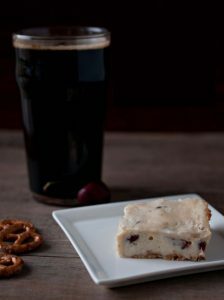 Enjoy your Cherry Stout Cheesecake, of course with your favorite brew!